Stringing Fool: Focus on: Growing Green!!! Where can you look and NOT see green? My world is green. Everywhere you look, everything that either should, and in some cases should not be green, is green around here. So responding to Sally Russick's prompt "Green" was not very hard. You may remember these babies from Our Focus on Macro posting. Some other selections from the container garden - and green containers! 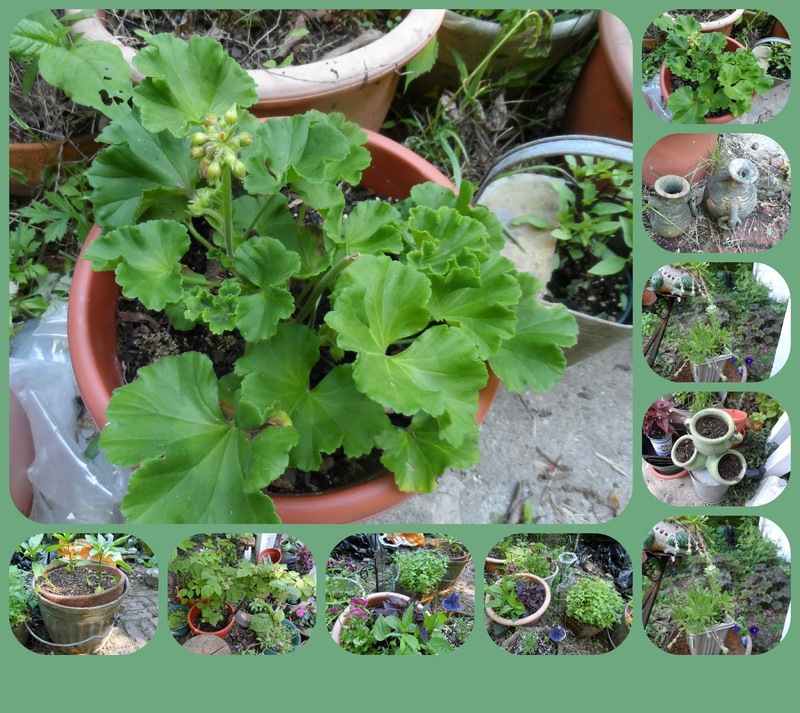 To see more greenery, stop by Sally's blog, The Studio Sublime. Love all your wonderful plants, esp. the sempervivums!! I still really am covetous of the frog planter. And the plants in them have really grown. Oooh, I love your little frog planter - isn't he just the sweetest! 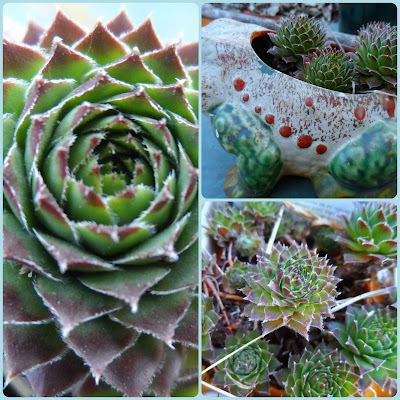 Lovely selection of plants, and a great closeup shot of the Sempervivum. you have such a green thumb! 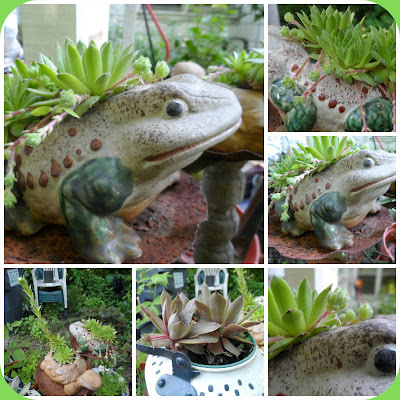 my thumb is on the brown side :( I love all your succulents and frog planters - so cute! 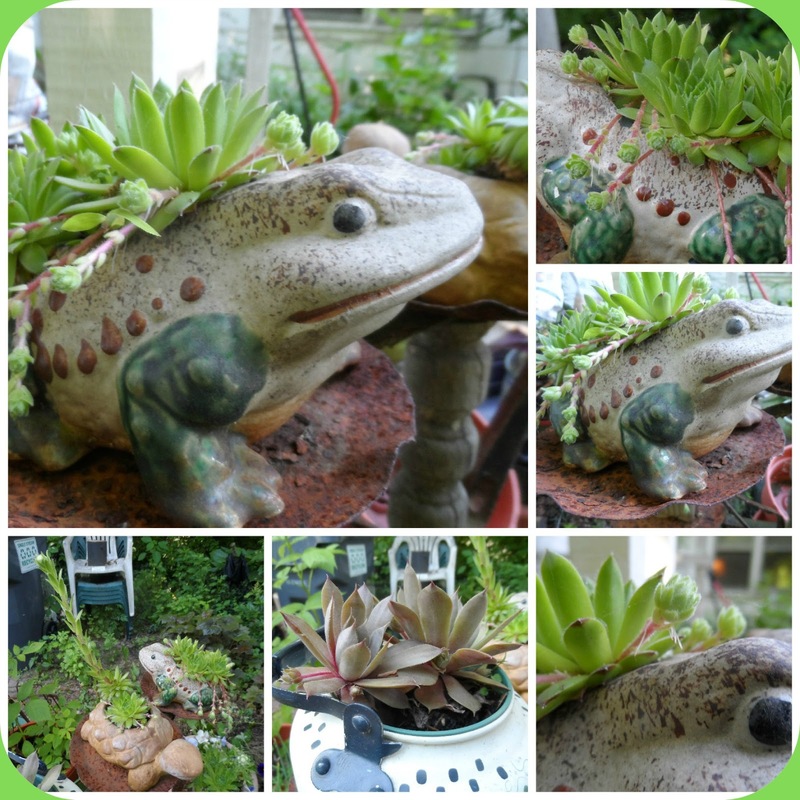 Love the frog planter. Reminds me of our visitor I photographed for this weeks prompt. Great collages. 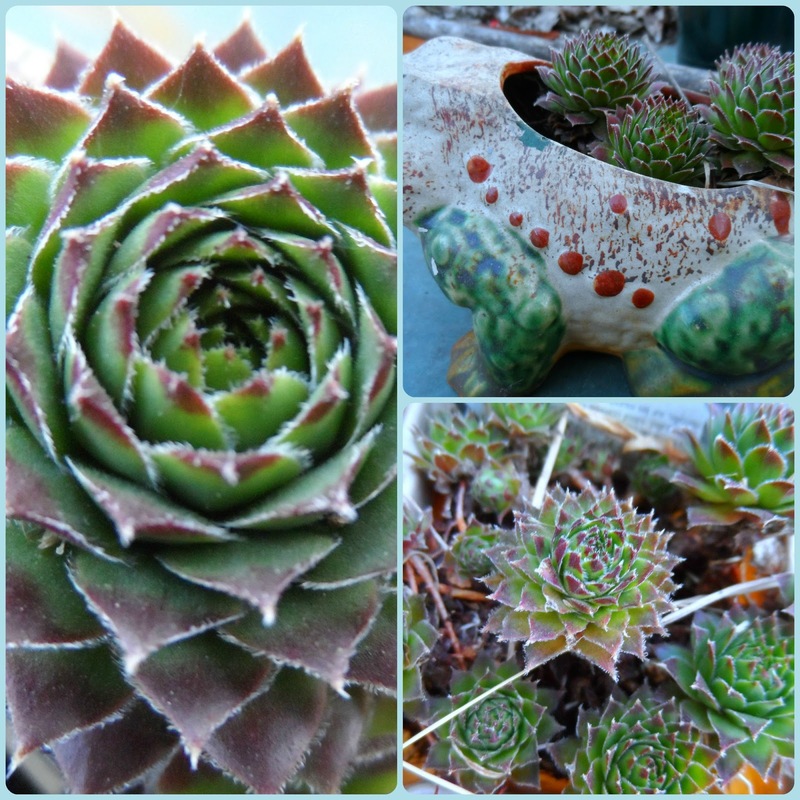 Lovely Sempervivums - great greens all around - awesome shots! I still love the frog planter! Great shots of green! Great pics this week Beti. Your frog planter reminded me of the frog banks my mother-in-law made for my boys when they were young. So true! with all the rain we have had on the east coast, everything is green, too. Love your succulent's. Love your collages. That frog looks like he's ready to jump! Now this reminds me of my aunts cactus garden.. She had other various plants and succulents.. But the one thing I do remember is this huge spider that just hung around the garden. He had beautiful colors on him. Thanks for the memory. Great shades of green and the frog planter is still doing his job! I'm not sure if so much rain is necessary but it seems to be what we are getting as well. It sure does make everything green and perfect for this week's prompt. Lots of lovely greens here! You must have a wonderful garden. Love the frog!!! SOme of my containers got drowned others blew over... After you'fe last post and checked and discovered that all my hens and chicks had died... may have to try growing them in a cute container!